" The challenge was to create a superb sounding interconnect, applicable in both analog as well as digital situations, with a very friendly consumer price to help people who want to upgrade their audio or A/V setup by replacing the standard issue nameless interconnects for affordable better ones. Over twentyfive years of experience with building cables were available when we set this goal. This meant we knew what materials to select and how to combine them to make an ideal match. It’s like the house wine in a high class five star restaurant: it’s not the best in stock, but you can’t go wrong since they have a good reputation to lose. And so do we! 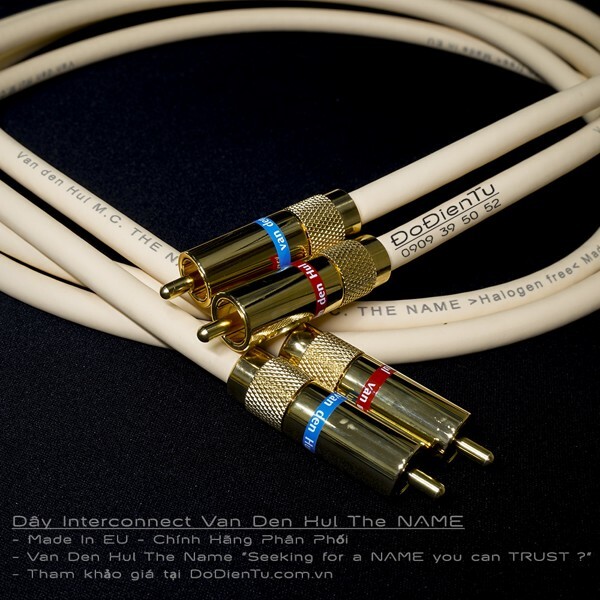 jacket and very special click-on technology connectors complete this great 75 Ohm interconnect "
Van Den Hul The Name " Cái tên bạn có thể tin cậy "
Nhiều người đang tìm kiếm một hệ thống dây cáp với chi phí hợp lý trong thiết bị âm thanh / video gia đình của họ bị nhầm lẫn bởi nhiều sản phẩm cáp "vô danh" có sẵn trên thị trường . Vâng, sẽ không tốn nhiều chi phí .Nhưng làm thế nào để đảm bảo về hiệu suất, chất lượng và độ bền ??? Để làm cho sự lựa chọn của bạn dễ dàng, chúng tôi đã đưa ra một kết nối interconnect đa năng với giá cả phải chăng, trong khi vẫn duy trì bản chất xuất sắc đã được tìm thấy trong nhiều sản phẩm cáp cao cấp của chúng tôi, mà Van den Hul đã nổi tiếng. Dễ dàng vượt trội hơn các thương hiệu "vô danh" trên thị trường, chúng tôi đã làm thêm cáp mới này mang tên "The NAME"
Sử dụng 2 lõi đồng trục 75 Ohm truyền dẫn ở tần số cao. Tuy nhiên NAME cũng hoàn hảo trong các ứng dụng AV như ăng-ten / truyền hình cáp, video, xung quanh và kết nối âm thanh số S / PDIF. Use The NAME as composite/RCA/CVBS video connection from your digital camcorder, video recorder, satellite receiver or DVD player to your television, high resolution TV, monitor or other video device. Use The NAME to connect your DVD’s surround sound output to a MPEG 2 or Dolby Digital™ decoder equipped component, e.g. a receiver. Use The NAME as digital audio link between your CD or DVD player and DA converter and further to your amplifier. Use The NAME for your cable TV and radio connections. Thiết kế cho khả năng chi trả trong khi vẫn đảm bảo chất lượng hàng đầu là một thách thức. Ở đây, chúng tôi đã có hơn 25 năm kinh nghiệm trong thiết kế và sản xuất cáp đã sử dụng tốt. Provides your signals excellent protection against unwanted noise and interference from the outside world’s radio frequency and other electromagnetic disturbances. A heavy 1.1 mm Ø central conductor provides high frequency bandwidth and low loss signal transfer. The cable’s construction furthermore ensures that the core is virtually unbreakable. Both the signal core and shield’s signal return are made of dense silver coated high purity Matched Crystal Oxygen Free Copper (OFC). This high quality composition maintains signal integrity and provides maximum durability. Signal quality that lasts! The internal insulation material which separates the conductors, physically takes part in signal transfer and its quality. Not overlooking this, The NAME is equipped with a prime material which supports optimum audio and picture fidelity. The NAME’s internal insulation provides minimized signal losses and a very low 59 pF/m parasitic capacitive load. Also the quality of the connectors makes a considerable contribution to a cable’s overall performance. The NAME comes fit with RCA type connectors of the same high quality as found with our up-range cables: Being non-magnetic, having Teflon internal insulation and being layer-plated with copper, silver and finally 24 carat gold, they provide a perfect and durable connection. Last but not least, The NAME’s dense silver coated conductors, as well as its rugged and hardwearing HULLIFLEX ® jacket provide an optimal protection against chemical (corrosive) attack from the outside world and ensure a very long lifespan. Employing durable materials and providing super sound and picture quality at a very affordable price, our The NAME is a true multi-purpose AV interconnect that lives up to its name. Why not get your wiring “NAME” ? Standard: Stereo pair box packed with RCA (unbalanced) connectors in 0.8 m. length. On request: The same in our other unit lengths: 1.0, 1.2 and 1.5 meter. (Lengths larger than 1.5 m. can be made on special request). Standard: In six lead packed sets for AV applications with RCA (unbalanced) connectors in 0.8 m. length. for antenna/cable TV and radio connections in 1.0, 1.2, 1.5, 2.0, 2.5, 3.0, 4.0 and 5.0 m. lengths. (Larger lengths can be made on special request). The NAME is NOT sold on reels.
" The challenge was to create a superb sounding interconnect, applicable in both analog as well as digital situations, with a very friendly consumer price to help people who want to upgrade their audio or A/V setup by replacing the standard issue nameless interconnects for affordable better ones. Over twentyfive years of experience with building cables were available when we set this goal. This meant we knew what materials to select and how to combine them to make an ideal match. It’s like the house wine in a high class five star restaurant: it’s not the best in stock, but you can’t go wrong since they have a good reputation to lose. And so do we! With this solid core coaxial interconnect, made of dense Silver coated Oxygen Free Copper, we think we’ve set a new high in the absolute value-for-money area. A very nice desert-sand colored Hulliflex ® jacket and very special click-on technology connectors complete this great 75 Ohm interconnect "